Money is supposed to be a store of value. After the recent collapse in the dollar convertible price of Bitcoins, the inevitable scrutiny in the viability of the monetary system is warranted. The official description of Bitcoin states: Bitcoin is an experimental, decentralized digital currency that enables instant payments to anyone, anywhere in the world. Bitcoin uses peer-to-peer technology to operate with no central authority managing transactions and issuing money carried out collectively by the network. Purported myths and ground rules on how the alternative currency operates, provides calculated reading. Whether this accounting system can or would be accepted as an credible medium of exchange on any large scale is certainly an open question. The need for an alternative currency to fiat debt created tender is apparent. However, establishing faith and acceptance in a competing and digital method of payment for transactions is almost inconceivable to the average consumer. The Business Insider in Bitcoin Is Changing The World provides an analysis and a risk warning report. "Bitcoin’s inventor, Satoshi Nakamoto, is a mysterious hacker (or a group of hackers) who created it in 2009 and disappeared from the internet some time in 2010. Reddit, a social-media site, and WordPress, which provides web hosting and software for bloggers. The appeal for merchants is strong. Firms such as BitPay offer spot-price conversion into dollars. Fees are typically far less than those charged by credit-card companies or banks, particularly for orders from abroad. And Bitcoin transactions cannot be reversed, so frauds cannot leave retailers out of pocket. Yet for Bitcoins to go mainstream much has to happen, says Fred Ehrsam, the co-developer of Coinbase, a Californian Bitcoin exchange and "wallet service", where users can store their digital fortune. Several Bitcoin exchanges have suffered thefts and crashes over the past two years. But the real threat is competition. 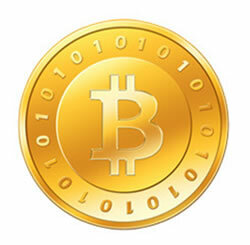 Bitcoin-boosters like to point out that, unlike fiat money, new Bitcoins cannot be created at whim. That is true, but a new digital currency can be. Alternatives are already in development. Litecoin, a Bitcoin clone, is one. A less nerdy alternative is Ripple." Wow . . . the innovative advantage for merchant acceptance might make one think that Amazon will be jumping into the cauldron and become the big daddy digital vender. Nonetheless, the spike and fall that has the appearance of a Bitcoin bubble will certainly give pause to any large retailer that is flirting with accepting payment through an exchange. The implication in the article, Why Bitcoin crashed, and how Ripple might avoid the same fate, sets out the risks involved. "That single point of failure is the most popular Bitcoin currency exchange, Mt Gox. There are other exchanges, but the bulk of Bitcoin trading happens there. Mt Gox claims to have been hit over the last couple weeks’ mania by the twin ills of denial-of-service attacks and sudden, excessive popularity, both of which amount to the same thing: Mt Gox’s systems falling over. The operation (which is based in Japan) has also shut down its own service at least once in an attempt to "cool down" the market. And every time that has happened, a panic sell-off has been the result. That’s not surprising: Mt Gox’s status as the best-known exchange has led it to become the main data source for most of the Bitcoin rate visualizations out there, so when Mt.Gox goes down it affects visibility for a lot of people. And when people can’t see what’s going on, they panic, find another exchange and sell, sell, sell. Same goes for the biggest exchange unilaterally deciding to cool down the market – hardly a sign of viability." If the Bitcoin crash was simply a function of clearing house settlement failure, the claim that Bitcoins retain the properties of money evaporates. Blaming the breakdown on an exchange, illustrates that Bitcoins have more in common with the properties of a stock or commodity, than a hard currency. The video, Bitcoin Mania! 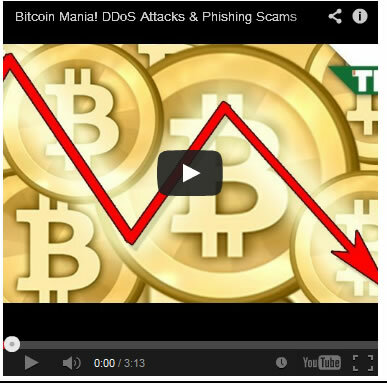 DDoS Attacks & Phishing Scams, reports on the speculative nature of a virtual currency that operates in the etherzone of the cyber world. The Fierce Markets site announces Jeff Berwick’s effort, Here come the Bitcoin ATMs. "Somewhat like a traditional ATM, says Berwick. Instead of connecting to your bank account, the software he and his team have developed is installed on an ATM and converts cash to Bitcoins stored in a Bitcoin wallet or extracts cash based on what's stored in your personal Bitcoin account." Bitcoin convertibility back into a legal tender paper currency might go a long way to establish a workable alternative to using the bankster banking system. However, this digital currency is only as solid as the confidence level of users to store wealth in a medium that promises the return of capital or its equivalent value. For now, Bitcoins has all the trappings of a speculative scheme to harvest profits, explained in the article, Bitcoin Miners Are Racking Up $150,000 A Day In Power Consumption Alone. "Bitcoins are "mined" by unlocking blocks of data that "produce a particular pattern when the Bitcoin ‘hash’ algorithm is applied to the data." Blockchain.info, which tracks Bitcoin-related data, estimates that miners are generating $470,000 in Bitcoin-related revenue per day. In fact, due to the recent interest in the virtual currency and its popularity, operating margins for Bitcoin miners are close to record highs." Such practices do not conform to the properties required to qualify as money. It would seem to describe Bitcoins as an alternative accounting organism to the central banking system. In that regard and goal, the merits of instituting a functioning and reliable digital currency, should be encouraged. Nevertheless, the lack of market stability in Bitcoin value convertibility dooms this experiment in the absence of manipulative swings in currency quotations. The destructive consequences of floating currency rates have plagued consumers and savers alike for decades. The desired objective is a decentralized monetary system, digital or coinage that has a fixed convertibility and stable purchasing value.